Since the 1900s, Michigan has produced a large quantity of tart cherries, valued for use in pies, juice and preserves. The state is rivaled only by the Pacific Northwest for cherry production, with Michigan growing the bulk of the tart cherry crop and the Northwest producing sweet fruit. 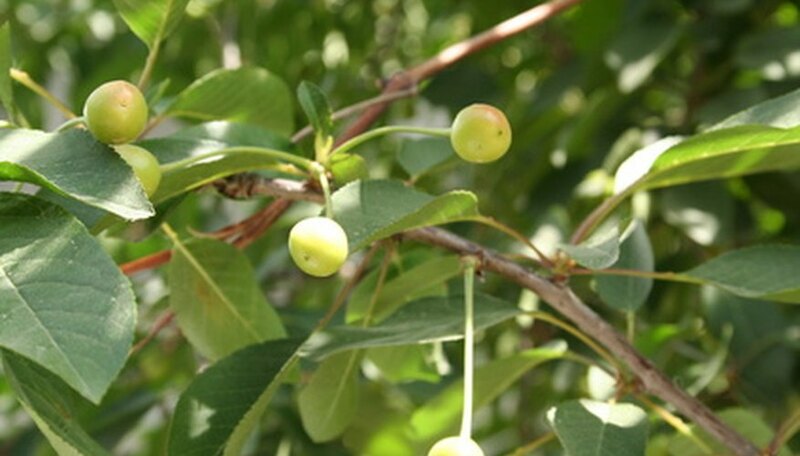 Home growers can plant sweet or tart cherry trees to enjoy the first stone fruit of summer. Michigan's climate supports cherry production since lake winds cool down hot summer temperatures and buffer cold winter ones. Select a site for planting your cherry tree sapling in the spring when frost danger passes, typically from mid May to mid June, depending on your Michigan community. A good site offers full sun and well-draining soil and is slightly elevated to protect the cherry tree from frost. Dig a hole twice the size of the cherry tree's root ball. Pull rocks, roots and weeds out of the hole. Remove your cherry tree from its container. Break apart the root ball by massaging it between your fingers. Unwind tangled roots. Trim the ends of broken roots with clippers. When all the roots are separated, the tree is ready for planting. Place your cherry tree in the prepared hole so it sits at the same depth it was planted in the container. Holding the tree upright with one hand, backfill the hole with soil to plant the tree. Water the newly planted cherry tree until the soil compresses around the base of the tree and the ground becomes saturated. Mulch the base of the tree with a 2- to 3-inch layer of mulch to help the soil retain moisture. Prune the cherry tree sparingly until it begins to bear fruit. Always prune in the dormant season when frost danger passes. Remove dead branches and those that grow poorly, including downward-growing branches, branches that hug the trunk too closely and those that crisscross other limbs. Fertilize the cherry tree annually in the spring with nitrogen fertilizer. Purdue University's Department of Horticulture advises applying 0.1 lb. of nitrogen fertilizer per year of tree age, with a maximum application amount of 1 lb. nitrogen fertilizer. Scatter fertilizer on the ground around the base of the tree. Then water the ground to disperse the fertilizer into the soil. Plant a one-year-old cherry tree sapling. Montmorency is the major tart cherry variety, though gardeners can plant lesser-known types of tart cherry. Choose a recommended sweet cherry variety from Michigan State University's list, which includes Glacier, Rainier, Hudson and Chelan (see Resources).